Nutritional yeast and active dry yeast are not interchangeable ingredients. Although both have "yeast" in their names, that's where their similarities end. Nutritional yeast is a deactivated yeast that is used, especially by vegans, to thicken sauces and mimic the flavor of Parmesan cheese. Active, dry yeast is an activated yeast usually included in breads to make them rise. While you might include nutritional yeast to boost your daily nutrition, active dry yeast cannot be used as such a supplement. Yeast is a one-celled fungus. When active, dry yeast eats sugar and starch and releases carbon dioxide bubbles and alcohol, which causes dough to rise. Active, dry yeast is dormant in the package, but it's easily activated by adding warm water and sometimes a bit of sugar. Nutritional yeast is the same organism, but it's been heated to such a high temperature that it is no longer alive and active. Find it in a crumbled or flaked form in health food stores. You can't eat active dry yeast straight from the package because it will continue to grow inside your digestive tract and steal nutrients from your body. Because it's been deactivated, nutritional yeast won't grow inside you and may boost your nutritional status. Use it straight from the package to sprinkle on popcorn, toss into pasta or stir into a vegan "cheese" sauce. 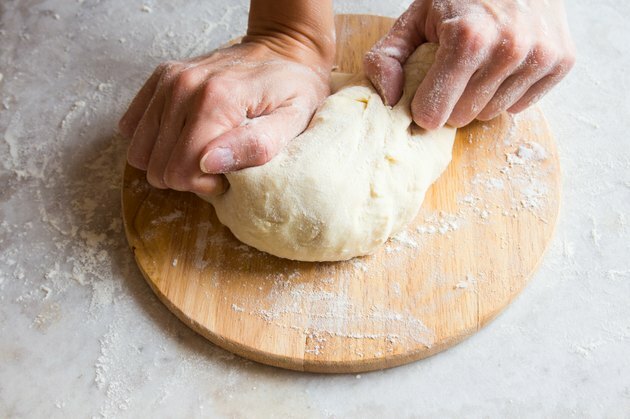 You can only enjoy the nutrients in active, dry yeast as part of a cooked dough recipe. One tablespoon, which makes one to two loaves of bread, contains about 5 grams of protein, 5 grams of carbohydrates and 3 grams of fiber. It also offers small amounts of calcium, B vitamins and potassium -- but when these are distributed into an entire loaf of bread, the effect on your nutritional status is minimal. Nutritional yeast, however, is usually consumed a tablespoon or more at a time. In 12 grams, or 1 tablespoon, you get 6 grams of protein, as well as the 5 grams of carbs and 3 grams of fiber. Vegans and vegetarians often consume nutritional yeast to obtain vitamin B12, an essential vitamin primarily available in meat and poultry. Nutritional yeast doesn't naturally contain B12, but many producers fortify it. So, if B12 is the reason you're consuming nutritional yeast, check the label to ensure that you're getting a fortified version. Active, dry yeast has only trace amounts of B12. Is Nutritional Yeast Safe During Pregnancy?